This quote is one of several interesting comments made recently by Mario Cipollini in: Cipollini decries modern cycling's lack of machismo. I like this quote, it puts the grit back in competition. I've been watching these post race scenes wondering it must be hard to go from a must win attitude to all smiles a second later, unless the win is either determined ahead of time, or their sponsor is encouraging them to go hog the limelight whether they win or loose. 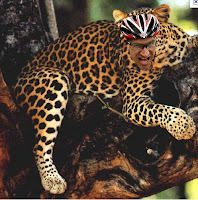 Today's big news was the announcement that the new Team Luxembourg Cycling Project will officially be going by the new team name Leopard. Alright, I say bring back the Mario Cipollini skinsuits! Team Leopard! I like it. 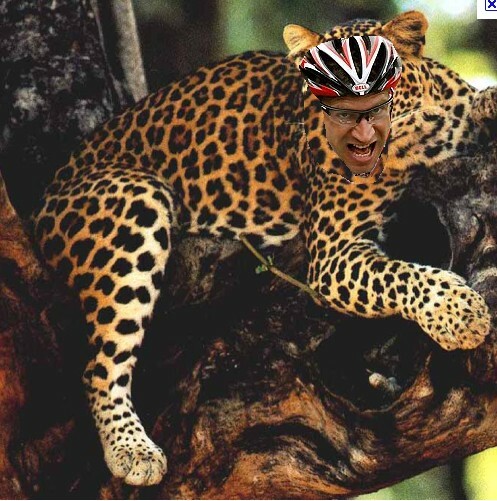 I think Jens Voigt would look good in spots. Now we're talking Macho! Team Leopard could redefine what has solely been the fashion statement of the American Cougar.